Yes, that's two seasons--a club season and a school season. Westside United U-14 played its last two league games on Saturday at Lawrence Park. They defeated Westfield in the morning game and fell to Carmel United in the afternoon. The team ends the season tied for second place in the league. 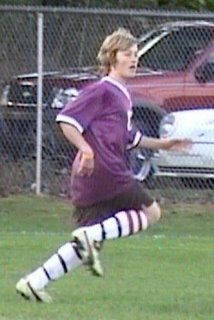 This was Sam's first season with Westside United and he seemed to gel well with the team. He had a handful of goals and numerous assists. The team won the pre-season Pike Fest tourney and competed quite well in interstate tourneys in Kentucky, Ohio, and Illinois. Sam's Ben Davis 7th & 8th Grade team also concluded with a strong second half of the season. The team finished over .500, winning 6 of its last 7 games. Sam was a team captain and a leading scorer for the Giants. The 8th graders on the team will be part of the pool of players eligible to play Jr. Varsity and Varsity at Ben Davis High School next year. I think some of these players, including Sam, hold promise for making an immediate positive impact with BD. Great work thoughout these seasons, Sam. It's been a busy sequence of months and weeks. You've worked hard, adjusted to new team situations, and developed in leadership. It seems like your passion for the game is growing. We enjoyed watching and supporting you. Next up: wrestling! Good job and good luck with wrestling this winter, Sam! I love you!